Experts from different industries gathered at one place to create a blockchain zone in Jeju Island. 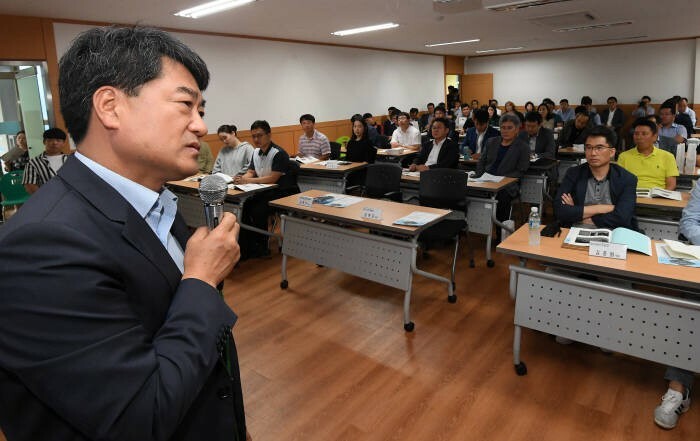 ‘Forum for Experts to Successfully Pursue Blockchain Zone in Jeju Island’ that had KBIPA (Korea Blockchain Industry Promotion Association), Jeju Startup Association, Jeju International University, Credit Union, and Jeju Bank in participation was held on the 6th. Jeju Island is currently pushing to appoint ‘Blockchain Regulation Sandbox Zone’ into Special Government Act. With Governor Won Hee-ryong in charge, Jeju Island is planning to pursue creation of blockchain zone in Jeju Island by end of this year that will eventually allow ICO (Initial Coin Offering) and attract global cryptocurrency exchanges. Under a plan to make Jeju Island a global blockchain zone and a popular blockchain hub city where there are many openings of new businesses, a meaningful discussion was held with relevant associations, groups, universities, and legal circles in attendance to figure out how to create a successful zone in Jeju Island and to think about tasks that need to be resolved. Chairman Kim Hyung-joo of KBIPA, who was the first to present at this forum, chose improvement in South Korean Government’s perception on blockchain and cryptocurrency, creation of blockchain industry and industry-university-research institute clusters, creation of regulation-free zone based on sandbox regulation, and creation of corporate investment environment through tax reform as challenges that need to be solve prior to creating blockchain zone in South Korea. He also explained that there must be a process that bands blockchain zone with other local governments from Busan and Gangwon-do. Methods of setting up legislations for creating blockchain zone had also drawn interests. “There are not current laws that directly regulate blockchain and cryptocurrency.” said Attorney Han Seo-hee of KBIPA’s Legal Support Group. “It is difficult to regulate blockchain and cryptocurrency with single law.” She also expanded further by saying that it is not easy to legislate cryptocurrency and blockchain separately due to their correlation and she also presented alternatives to legal issues. “Various legal problems must be solved by utilizing various acts.” said Attorney Han. She especially emphasized that it is important to attract top domestic and foreign capitals and businesses and to quickly pursue development work by utilizing Jeju Special Act. She also announced that submission of opinions on legislative bills of Governor Won Hee-ryong and application of legislation through examination on validity by the central administrative organization and review by a supporting committee, establishment of sequential transfer of the central administrative organization’s authority, liberalization of regulations, establishment of comprehensive plans towards development of an international free city, exemption of tax burden, exception for entrance of foreigners into South Korea, and enhancement of industrial development and autonomous decentralization are necessary. Examples of development of blockchain platforms for local societies and industrial innovation had also drawn interests.